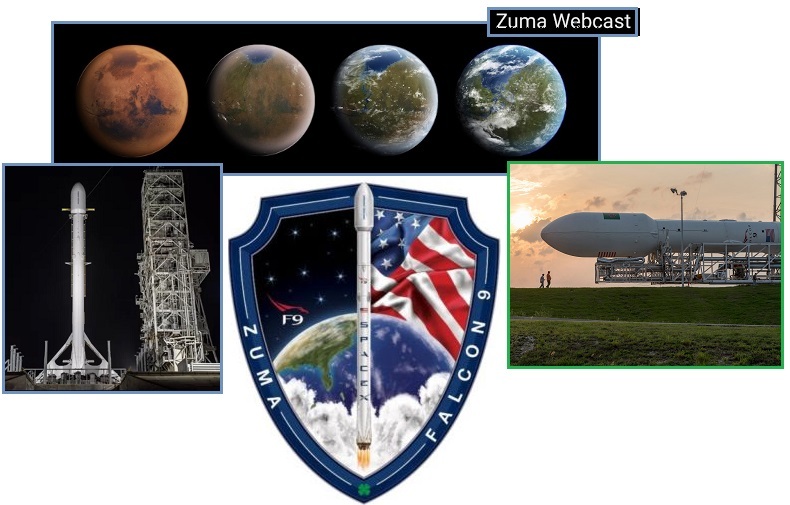 Last November, 2017 when the Zuma launch was delayed, the Zetas stated the purpose of Zuma was to launch a low-Earth orbit satellite equipped to spy on Nibiru but having a restricted audience. The Deep State, full of opportunists and criminals, was not to receive any data from Zuma. Apparently, the November launch was not secure, but after recent Deep State cleanup it has proceeded. The Deep State is not happy about their lack of access. ZetaTalk Insight 11/30/2017: What is Zuma’s secret mission? Space X is considered a restricted environment, outside of the normal federal program development process. Federal expenditures require approval and tracking, auditors, Congressional oversight, and many civil servants who cannot be fired or bypassed. At the present time, the Junta in charge of the US and Heads of State in China and Russia are most concerned that they, in government, are able to compute when the Last Weeks are approaching. Zuma’s payload will include infrared and dozens of other sensors which can help estimate the approach of the passage. The Deep State, with its many agendas, will not be privy to this information. Did SpaceXs Secret Zuma Mission Actually Fail? Rumors started circulating that the satellite malfunctioned when it reached orbit, and that Zuma actually fell back to Earth and burned up in the planet’s atmosphere. So what really happened to the satellite? No one is speaking up on the record, but it seems clear that something went wrong. Following SpaceX’s launch, a new entry was made in the catalogue on Space-Track.org for a US satellite designated USA 280. SpaceX lofted the super-secret Zuma spacecraft for the U.S. government, successfully executing a mission that also featured yet another landing by the first stage of the company's Falcon 9 rocket. SpaceX was able to land the booster’s first stage, while the second stage continued to carry the secretive Zuma payload to its destination in low-orbit. The payload failed to detach from the second stage properly. The Zuma satellite was attached to the second stage of the Falcon 9 rocket, which is designed to fall back to Earth and burn up in reentry. The payload fell back to Earth attached to the second stage of the Falcon 9. The satellite “may be dead in orbit” after it separated from the SpaceX rocket. ZetaTalk Insight 1/31/2018: Contrary to being a failure, Zuma is a smashing success! The goal, as we stated when Zuma was delayed last November, was to be restrictive, so that the Deep State would not be privy to the information Zuma sent back. How best to explain the silence but to claim a loss! Silently sailing in low-Earth orbit, Zuma is collecting information on Nibiru’s approach, and returning this treasure trove to the Junta in charge in the US and Heads of State in China and Russia. Those who would use the information for harm will not be informed. The Deep State in the US immediately had a hissy fit about being denied information on Zuma’s purpose, its orbit, and certainly on any data that it might be sending back to eager ears and eyes on Earth. What is known is that Zuma is a Low Earth Orbit satellite. Also, that it has been assigned a tracking number – USA 280 or 2018-001A. Under the guise of demanding to know what tax-payer funds were spent, by what agency, Congress is in fact demanding to know what Zuma is reporting. The Pentagon is not saying anything about the fate of the military payload, code-named “Zuma,” that was launched this week and may have crashed soon after, and neither is anyone else. SpaceX has said its Falcon 9 rocket “did everything correctly” but says it cannot provide any more details because of the classified nature of the payload. Northrop Grumman built the satellite and, according to published reports, the decoupler as well. It’s not issuing any statements, saying it can’t comment on classified missions. One thing is obvious: The Pentagon isn’t planning to clear up the mystery anytime soon. It’s not even clear if the U.S. military was the U.S. government agency that paid for the satellite in the first place. The Pentagon refused to say anything at a briefing Thursday about why a classified U.S. government satellite launched by a contractor failed to reach a stable orbit and instead plummeted back into the atmosphere in what is presumed to be a total loss over the weekend. It is believed to have plummeted back into the atmosphere and ended up in the Indian Ocean. On Capitol Hill, lawmakers and staffers in both the House and Senate have been briefed about the satellite. In briefings following the botched mission, lawmakers have been told the spacecraft took eight years and about $3.5 billion to develop and build, according to industry officials familiar with the details. 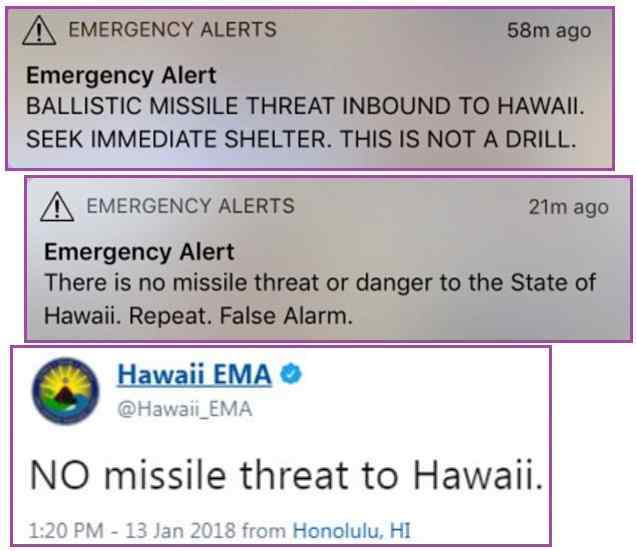 As the brouhaha over a Hawaii alert shows, there is a war going on behind the scenes. Consider the Black Hats to be those who want the cover-up over Nibiru to continue, and are controlling the media to that end. The Black Hats likewise have attempted for decades to put much of the world into debt, debt slavery, via the International Monetary Fund and the World Bank. The White Hats are the Transformation team, a motley crew referenced by the Zetas in the past, which includes Anonymous, ZetaTalk, Ben Fulford groups, Trump and his Junta, and the Puppet Master. We should, I think, include the Council of Worlds as an influence over the White Hats. ZetaTalk Comment 1/31/2018: As we have stated, the Council of Worlds has taken steps to slow down the 7 of 10 Plate Movements with humming boxes, in order to allow the establishment more time to inform the populace. 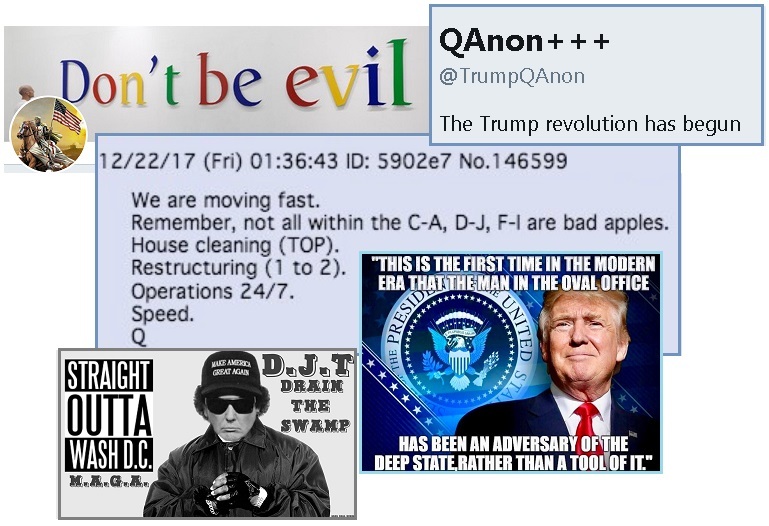 The overall outcome - the Pole Shift – will not be stopped or delayed. In the interim between the present, when most of the world is unaware of what is coming, and the hour of the Pole Shift itself, will be a time of challenge for man. This is in the hands of man, and thus cannot be predicted. This will likewise vary from country to country, from religion to religion, from family to family, with every possible variation expressed. At 8:07 am Hawaii was sent into a panic, as an alert went out telling the citizens that a missile was on its way. The assumption was of course that N Korea had attacked, as they had so frequently warned they would. But within a few minutes other alerts went out saying it was a false alarm. The excuse given was that the “wrong button” had been pushed, presumably during an exercise. Confusion reigned, with Trump clarifying that this was a state, not federal exercise that went awry. Residents received a phone alert for an 'inbound ballistic missile threat' that was accidentally sent out by Civil Defense but which was not corrected for the best part of an hour. A similar message flashed up on local television networks and brought live sports games to a halt. It was caused by an employee at Civil Defense who 'pushed the wrong buttons' during a staff handover. Within 12 minutes, the state's Emergency Management Agency tweeted that it was a false alarm and local politicians confirmed the mistake as well. It however took another 37 minutes for Civil Defense to send out another phone alert. The false alert was the result of human error — and boiled down to someone pushing the wrong button. The White House said in a statement that, "The President has been briefed on the state of Hawaii's emergency management exercise. This was purely a state exercise." The state has said the alert was an error, not an exercise, however. ZetaTalk Insight 1/31/2018: What occurred in Hawaii on Saturday, January 13 was neither an exercise nor an accident. If the system were being tested during an exercise, the message stating ‘This is Just a Test’ would have been included. And there is no casual button that someone can press that would send out an alert. There are checks and balances. We are thus left with the conclusion that the alarm was deliberate. The question is why. Hawaii is a Democratic state, Obama’s home state, and at present a number of Democrats are heading for investigation and prosecution. Hillary’s sale of US Uranium to Uranium One, a Russian corporation, for cash and Hillary’s funding of the GPS Russian Dossier fraud are on the plate, with Obama either looking the other way or assisting. The Democrats see the 2018 election as a loss. The Nibiru cover-up and the allies within the Deep State see their control slipping away. Only triggering World War III with Korea can rescue them! Or so they hoped. As we recently mentioned, they hope to trigger Martial Law so their sleeper cells within the military can grab control of the US. Many have noted that the official explanation given for the Hawaii alert has many holes, and is frankly not believable. The most plausible explanation is that a real missile was sensed, approaching, and thus the delay to cancel the alert. It would not take much to trigger the alert system, so any type of missile rising from any type of submarine could do it. The goal was to trigger Trump to snap and declare war on N Korea, which he did not do. The cabal hoping to create chaos, to depose Trump and gain control of the US military via sleeper cells, failed once again. Instead, their lackeys have been identified. Meanwhile, the whereabouts of Hillary Clinton are unknown. For the past two months she has not been giving interviews or make a public appearance. Even in response to the brouhaha over Trump’s supposed statement on “shithole” countries, the most we heard from Hillary was a tweet. Tweets can be send by anyone, from anywhere. Is she being held at Gitmo? Since the cleanup of the Deep State began in earnest, perhaps not to be trusted even under House Arrest, so now in solitary? Under the guise of promoting her new book What Happened, Hillary was interviewed on the CBS Sunday Early Morning show on September 10, 2017 and then by Ezra Klein of Vox on September 12, 2017 and then by Rachel Martin of NPR on September 12, 2017 and then by Anderson Cooper of CNN on September 13, 2017 and then by Terry Gross of NPR’s Fresh Air on September 14, 2017 and then by the liberal podcast site Pod Save America on September 17, 2017. 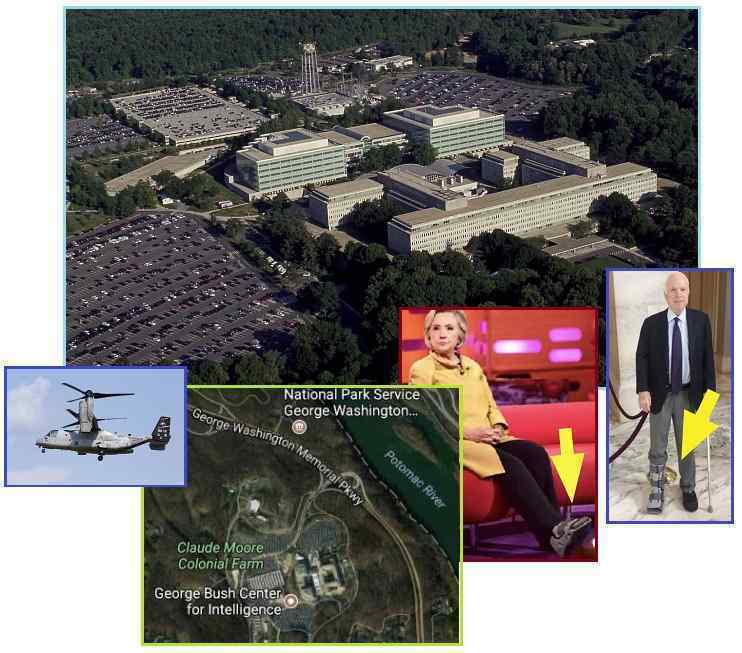 Then on November 17, 2017 the Marines landed at CIA headquarters at Langley and thereafter Hillary was wearing her House Arrest boot, as was John McCain. This boot could be seen on Hillary’s interview with Mark Helenowski of Mother Jones on November 17, 2017. She then gave an interview to Nico Pitney of NowThis on November 21, 2017 but then her public appearances and interviews stopped! Meanwhile General Mattis took a trip to Gitmo on December 21, 2017, and on December 21, 2017 President Trump wrote a broad Executive Order interpreted to mean that Deep State draining was to proceed full bore. Defense Secretary Jim Mattis visited the US Navy base at Guantanamo Bay, Cuba to offer holiday greetings to troops — the first trip there by a Pentagon chief in almost 16 years. The start of the ZetaTalk saga, in 1999, the Zetas stated that quake stress rolls around the globe from West to East, as the globe turns during its rotation. In fact, major quakes did appear around the globe in this fashion. I, Nancy, decided to document this process. 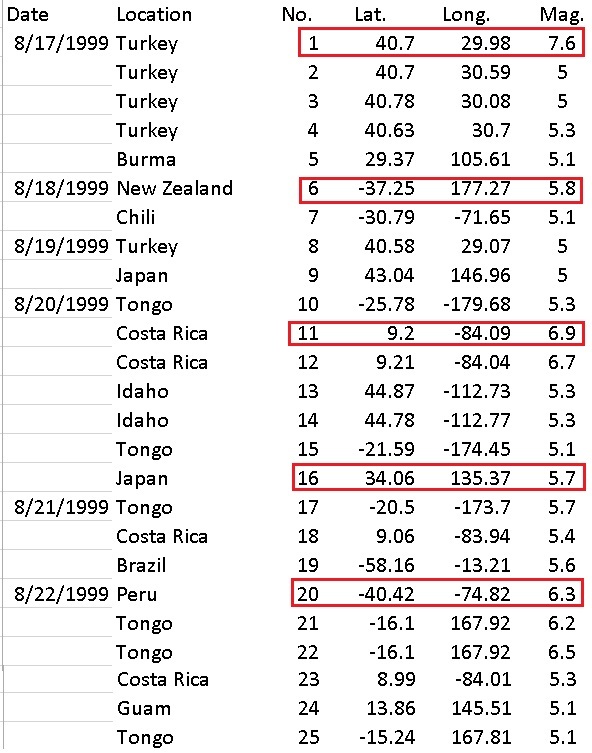 Between August 17, 1999 and August 22, 1999, major quakes marched from West to East around the globe 5 times, or 5 rotations of the globe. This per documentation I gather during the sci.astro debates. This pattern bears true today. ZetaTalk Prediction March, 1999: Deep Earthquakes have skyrocked at an exponential rate since the mid 1980, and this indicates a tightening up of these plates. Where this has not translated to surface quakes, it soon will, and you will find that because these deep plates are locked in that a quake in one place transmits to another, and you will have what Nancy has been referring to as domino quakes. Rather than months going by before a repercussion is felt in another part of the world, repercussions will happen almost instantaneously. 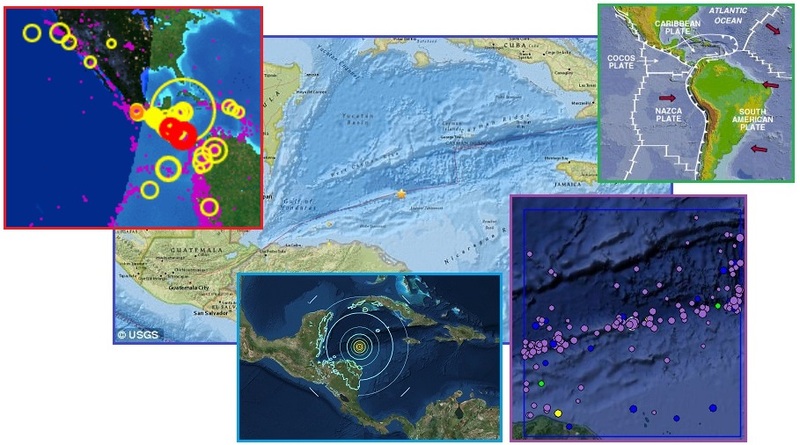 On January 10, 2018 a massive quake struck the edge of the Caribbean Plate offshore from Honduras. Claimed as a magnitude 7.6 quake, it was likely far more massive due to regular under-reporting by the USGS. 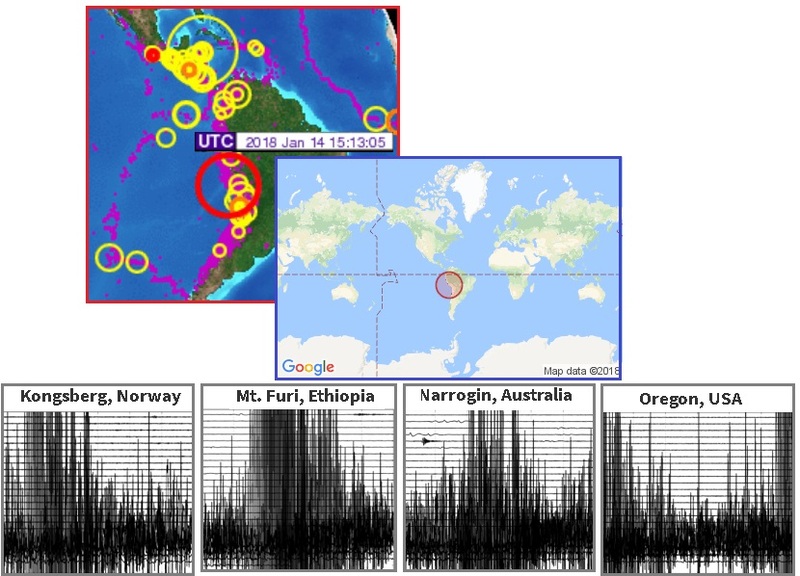 This quake was due of course to the 7 of 10 Plate Movements, specifically the S American roll which is pushing S America to the West, forcing the Caribbean Plate westward over the Cocos Plate. This activity can be seen by the number of quakes in this region. 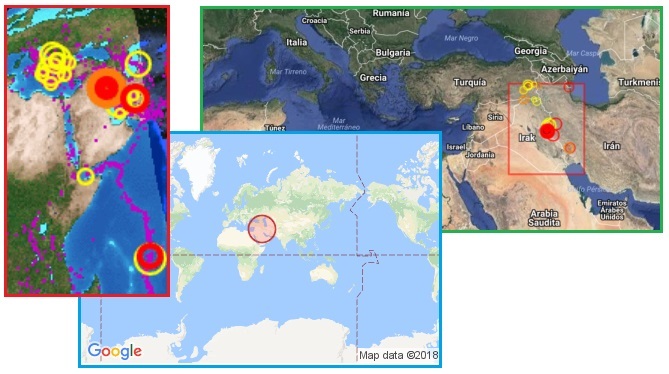 The next day on January 11, 2018 two other major quakes occurred, one early in the day at 6:59 UTC on the border of the Saudi Plate where it drives under the Eurasian Plate on the Iran-Iraq border. This is the region where another major quake occurred on November 12, 2017. The continuing quake swarms here show the process of the African Roll, where the African Plate pushes the Saudi Plate to the East. Note that this is West to East from the Caribbean Plate quake the day before. Then later in the day on January 11, 2018 another major quake occurred at 18:42 UTC in Myanmar, where quake swarms have also been appearing. This is where the Indo-Australian Plate is being driven under the great Eurasian Plate, a continuous pressure that drives the Himalayas higher. Once again, movement West to East in the quakes as the globe rotates. Zetas Right Again! Then on January 14, 2018 a major quake struck off-short of Peru, magnitude 7. 3 (though likely close to magnitude 10). Once again, due to the S American rolls, and ringing the Earth’s seismographs worldwide. And round we go, presumably, the cycle starting again!